In the rush between pumpkin-spiced October and cookie-studded December, November can be easy to miss. Before the month passes me the way that most have lately—in a total blur—I’d like a take a moment to celebrate November with Gingerbread Apple Muffins. These sky-high muffins are moist, healthy, and an ideal bridge between the fall that is still here and the holidays that are to come. Made with molasses, whole wheat flour, and a heap of holiday spices, their flavor is rich, warm, and even tempted me to turn on the Christmas music (too soon?). At the same time that these muffins ring a holiday bell, however, they also honor fall. I squeezed every bit of sweet, crisp apple into the batter that it could possibly hold. The result is a fruit-studded, cinnamon-spiced muffin that’s part harvest, part holiday, and wholly November. 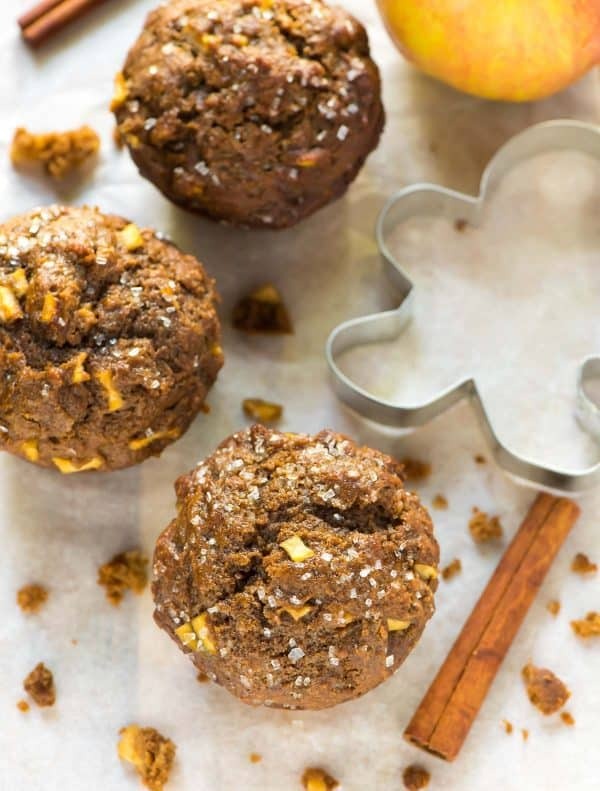 The recipe for these Gingerbread Apple Muffins are based off of my favorite Dark Chocolate Gingerbread Muffins. Although I fully support muffins studded with melting puddles of dark chocolate at breakfast, that extra indulgence feels a little more December to me. It’s still November, so for now, I’m still all about the apples. I *did*, however, keep the sparkly sugar muffin topping. Although it is optional, the muffins themselves are not very sweet, so I find it provides the right balance. I’m also completely smitten with the way the sugar turns into a yummy, lightly crunchy “lid” that I can pull apart with my fingers. Also, the sparkle. ? The holidays are coming, after all. 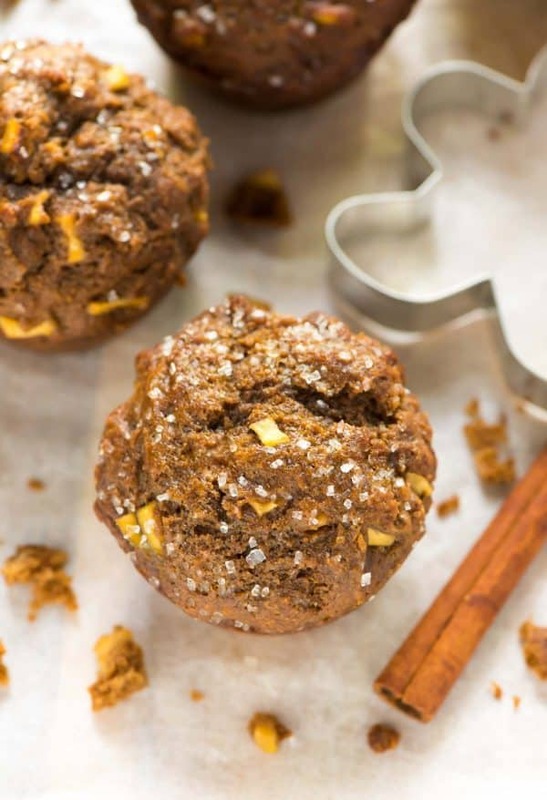 These Gingerbread Apple Muffins are freezer friendly, so if you are baking a batch (or a double batch), you can easily stow some away for quick, healthy breakfasts later on and for holiday guests too. I have everything you need to know about storing and freezing muffins in my guide How to Store Muffins, so be sure to check it out as well. Muffin tins: I love these for their handy lid and these for their even baking. Large scoop: My secret to tall, extra-fluffy muffins. 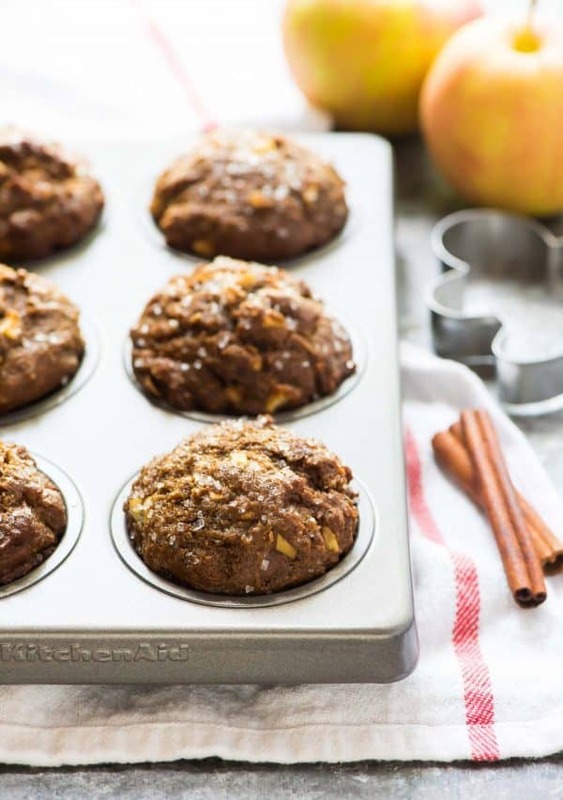 Healthy, moist Gingerbread Apple Muffins. Easy, delicious recipe made with whole wheat flour, molasses, and lots of warm holiday spices. Place a rack in the center of your oven, then preheat the oven to 375 degrees F. Lightly coat a muffin tin with nonstick spray or line with paper liners. In a small bowl, melt the coconut oil in the microwave, then set aside to cool to room temperature. In a separate, large bowl, whisk together the white whole wheat flour, all-purpose flour, baking soda, ginger, cinnamon, salt, and cloves. Fold in the diced apples, stirring gently to coat. Pour the wet ingredients into the dry and stir gently by hand, just until the flour disappears. The mixture will be lumpy and thick, but do not overmix. Divide the batter evenly between the prepared muffin cups (I like to use a large scoop like this, as it helps the muffins rise the best), then sprinkle the tops with sparkling sugar, if desired. Bake the muffins for 16 to 18 minutes, until the tops are dry to the touch and a toothpick inserted in the center comes out clean. Let cool in the pan for 5 minutes, then transfer to a wire rack to cool completely. Store or freeze muffins according to this guide for How to Store Muffins and Other Quick Breads. I have not experimented with making the muffins gluten free, but I think you could replace both flours with a 1:1 GF all-purpose baking blend like this one. Thank you so much, Kelly! I hope you enjoy the muffins if you decide to give them a try! Do you have to use white whole wheat flour? Can you just use entirely all purpose flour instead? And would 1% milk work instead of non fat? Hi Kim, yes, you can use all-purpose flour if that’s what you have on hand, and 1% milk should work too! I hope you enjoy the muffins! These look fabulous! Curious why not blackstrap molasses? I was all set to make them when I saw that. I only have blackstrap. Thanks. Hi Kim, blackstrap molasses behaves quite differently in baking and tastes a lot different than regular molasses (it’s bitter and salty by comparison), so regular molasses is what you’ll want to use here. Here’s a good article if you’re interested in learning more! Can I use brown sugar instead of coconut sugar? Hi Dave, check out the ingredient list! Brown sugar is mentioned as an acceptable substitute for the coconut sugar. I hope you enjoy the muffins! November is one of my favorite months and I definitely always take time to savor it! And I want to savor these muffins, too. Anything gingerbread this time of year is a win in my book! I’ll bet these are awesome! Can’t wait to make them! Thanks, Erin, for another great recipe! I hope you enjoy them, Laurie! Great flavors, I’m a huge gingerbread fan!! I made these today using Pamela’s gluten free Pancake mix, adding extra egg and used flax milk. I followed the rest of recipe but would add 1/2 teaspoon of baking powder next time. They are very good! Hi Karen, thanks for sharing the tweaks you made to the recipe! I’m glad you enjoyed the muffins! These sound so good and for a change I have ALL the ingredients to make them…that almost never happens! Thanks for the recipe – we love muffins. I love when that happens! I hope you enjoy the muffins, Chris! Hi, these sound really yummy and perfect for Fall. I was curious how you measured your flour for this recipe: dip and sweep, or light spoon into measuring cup? Great question, Hanaa! I lightly fluff it in the bag with my measuring cup several times, then level it off with a knife. OBSESSED with this combo! Literally the BEST of both worlds. I have been craving these ALL day! I love these muffins so much, the flavors are wonderful! loving this ginger apple combo. It’s so refreshing!! These muffins look delicious, Erin! Could I omit the molasses or substitute with something else? Hi Julia, molasses has a really unique flavor and consistency and is part of what gives gingerbread its signature taste, so I’m afraid that particular ingredient cannot be swapped or omitted. I’m sorry if that’s not the answer you were looking for, but I really want these to come out for you! Hi Erin ☺ These sound delicious! Very keen to try it but i just wanted to know if there is a substitute for the molasses? Thank you. Hi Fatema, molasses has a really unique flavor and consistency and is part of what gives gingerbread its signature taste, so I’m afraid that particular ingredient cannot be swapped. I’m sorry if that’s not the answer you were looking for, but I really want these to come out for you! These look great! Can you use maple syrup instead of molasses? Thanks! Hi Carla, I think maple syrup would be too thin and make the muffins too sweet. Molasses has a really unique flavor and consistency and is part of what gives gingerbread its signature taste, so I’m afraid that particular ingredient cannot be swapped. I’m sorry if that’s not the answer you were looking for, but I really want these to come out for you! Erin, YUM!!! Had all the ingredients on hand and I made them as an afternoon snack for the kids and myself. So delicious and fluffy. Great combo with the apples in there too. Another winner! Thank you. We LOVED these. YAY Sherrie, I’m happy to hear the muffins were a hit! Thanks so much for giving them a try and leaving this wonderful review! 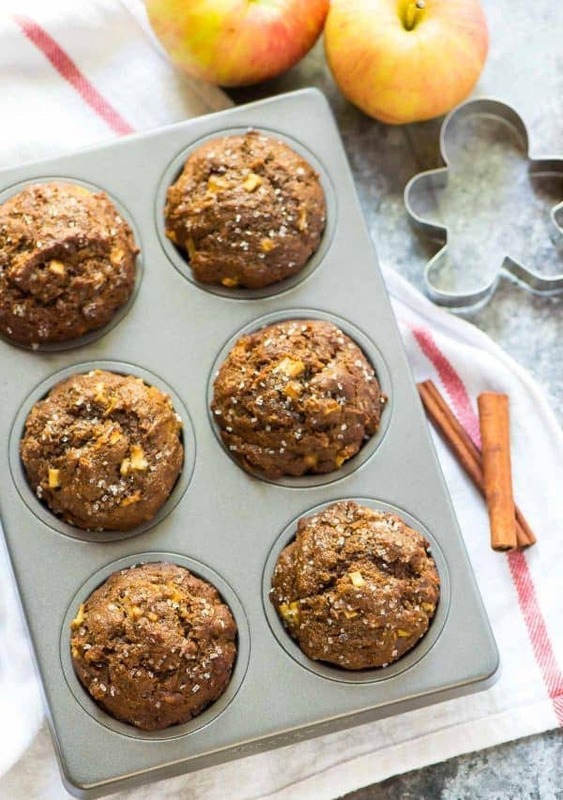 These muffins look amazing….I want to try them but wondering if there is a substitute for the greek yogurt. I was thinking maybe applesauce? Hi Laura, I think sticking to Greek yogurt is the safest bet, because it’s much thicker than applesauce and gives the muffins more structure and moisture than applesauce would. You could try playing around with half applesauce half yogurt to start, but the only way I can recommend is with yogurt, since that is what I tested. I hope you enjoy! I’m so excited by this recipe that I’m going to buy some sparkling sugar (why not?) this weekend to make them! I have everything else. yum!!! YAY! Lisa, I hope you enjoy the muffins! They were fantastic, by the way! It might be my favorite recipe yet. And that’s saying A LOT as I’m a pumpkin fanatic so usually those are my favorite recipes! These gingerbread muffins are calling my name! They look incredible, Erin! Could canola oil be substituted for coconut oil? I just made these and they are deeeeelicious! They definitely taste better when they are totally cooled down. (I couldn’t help but try them fresh out of the oven bc they smelled so good but it’s worth the wait). I ran out of eggs so made a chia egg and that worked just fine (mixed 1tb chia with 2.5 tb water and let sit for 5 min). Cut the sugar in half and used honey instead of molasses bc didn’t have any and it also worked. Maybe not the most potent/authentic taste as if I had molasses but they still came out great. The texture is chewy just like you’d want a gingerbread to be. The apples are divine in this. There was lots more batter than my usual muffin batter but I just piled them high bc it’s so thick it doesn’t run over and am glad I did rather than filling a second pan. Makes huge delicious muffins. Definitely a repeater! Hi Ana, thanks for taking the time to share your tweaks to the recipe! I’m so glad you enjoyed the muffins! As in the above comment, I thought I’d measured something incorrectly when I had so much batter – but just kept piling it in with hopes of them not spreading all over my nice clean oven. They turned out looking just like the huge ones you can get at the bakery and the taste was wonderful. I love gingerbread but these were much more “gourmet” than a plain pan of gingerbread. Chris, I’m happy to hear the recipe was a success and that you enjoyed the muffins! Thanks so much for chiming in with your review! I wonder if I could use sour cream instead of yogurt? All I have on hand. Hi Allison, I think that should work if that’s what you have on hand! I hope you enjoy the muffins. I just made these and they were absolutely fantastic! My co-interns and I have been having a rough week, and I decided we needed some comfort food to round out the week. These had the all comfort of a winter treat with the sweetness and “health” of the apple so I don’t feel terrible eating them. I will definitely be making these again! Melanie, I’m so happy to hear these muffins could be a bright spot in your week! Thanks so much for giving the recipe a try! I just made these, have not tasted yet, but they sure look Mahvelous!!! :-). I hope you love them, Lisa! Patricia, I’m so glad these are a winner! Thanks for taking the time to leave this awesome review!